CAPS researchers Ferenc Bogdan, John Hauer and Michael "Mischa" Steurer. Florida State University’s Center for Advanced Power Systems has unveiled a new 24,000-volt direct current power test system, the most powerful of its kind available at a university research center throughout the world. FSU founded CAPS 14 years ago as an innovative, collaborative research center where scientists could develop smart energy systems for the nation’s power and defense needs. 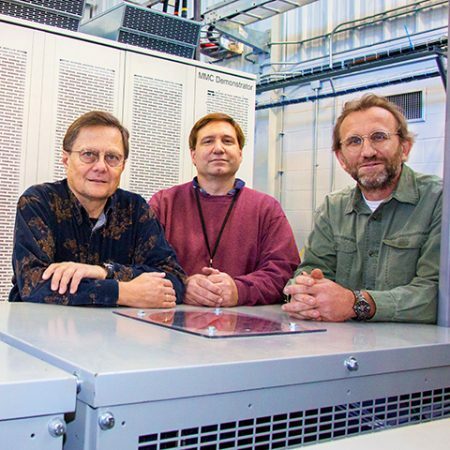 It pioneered the power hardware in the loop (PHIL) test facility model that has now been replicated at other institutions, including Clemson University and the National Renewable Energy Laboratory. The new test facility is the latest piece of the center’s PHIL testing program. It has a 24,000-volt direct current with a capacity of 5 megawatts, making it the most powerful PHIL system of its kind at a university research center worldwide. The MVDC system was built based on CAPS’ specifications by ABB Inc., as a technology demonstrator geared towards research activities. “This is the first time anyone has strung together four individual converters of this magnitude and operated them in a safe and controlled manner,” said Michael “Mischa” Steurer, senior research faculty and leader of the Power Systems Research Group at CAPS. CAPS researchers are also collaborating with Virginia Tech on a project for ONR to evaluate the performance of an electrical impedance measurement unit (IMU) developed by Virginia Tech and to be shipped to CAPS for testing. The purpose of an IMU is to probe a power system for its impedance characteristics to establish criteria for stable operation of the system. In plain language, impedance is the opposition a circuit presents to a current when voltage is applied at various strengths and frequencies. The Navy has also committed funding to study design and performance of fault current limited MVDC systems and other operational aspects of MVDC systems.